Mul cottons are really comfortable. Sohum Sutras has a range of them in indigo and in Shiboris. Contact us for more designs and colours. Sohum Sutras brings you Banarasi Katan silk Patola saree. It is an interesting concept merging weaves of 2 different states- Patola of Gujarat and Banarasi Katan weave. Unity in diversity. It is not a typical Banarasi saree and it is not traditional Patola or ikat but rather it is a fusion of the two. You can also order from Sohum Sutras website. 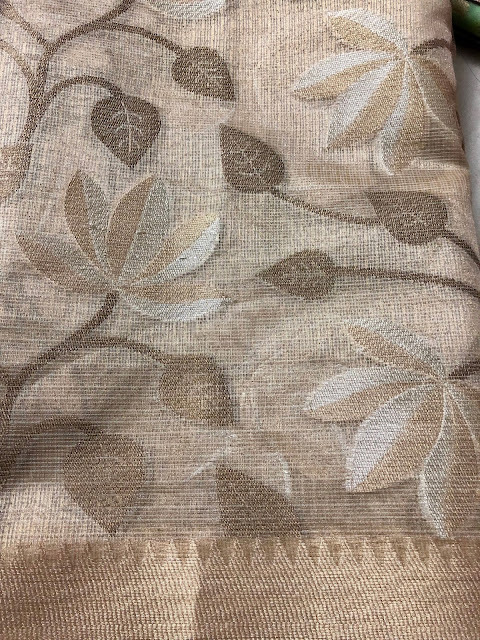 Very smart and elegant Banarasi net in subtle gold, silver and copper saree. It has a delicate orange selvedge. This saree is light as air and just flows. I can wear it at night time or day time- formally or casually. This Chanderi silk saree. Unusual, muted, subtle and rich colour. A thin stripe of gold zari, a mix of a broad border and thin stripes. This is an elegance to the core. You can dress it up or dress it down. Sohum Sutras lanunches Kani silk duppattas. They come with plain, unstitched silk suit. It has kani borders. You can style these according to your choice and size. These will have shirts and trousers. The scarf or the duppatta is exquisite kani. Below we are listing many colour options to choose from.